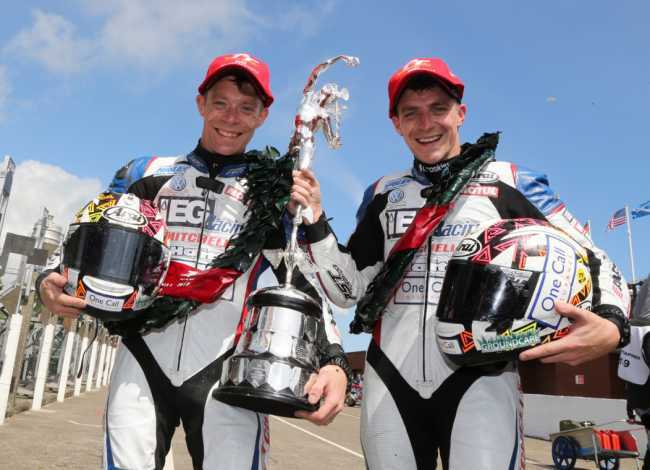 Ben and Tom Birchall won the second Sure Formula Two Sidecar race at the 2017 Isle of Man TT Races, fuelled by Monster Energy, on Friday afternoon, taking victory by 26.5s from John Holden/Lee Cain in a repeat result of the opening race on Monday. 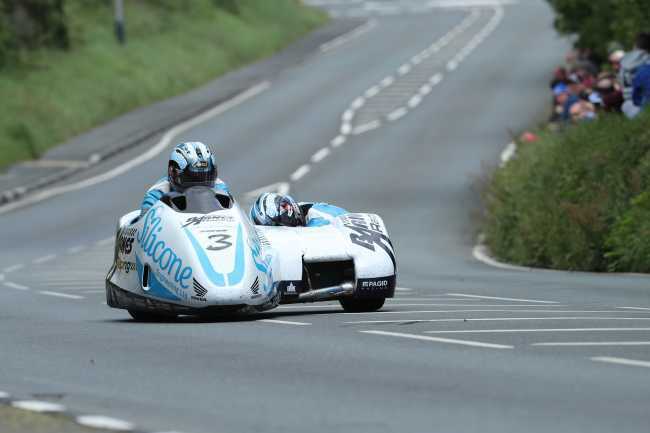 The Birchalls hit the front for the first time on the run from Glen Helen to Ballaugh on lap one and were never challenged again as they took their sixth TT victory. Holden took his 17th podium in second with Conrad Harrison/Andy Winkle, in their first TT together, took the final podium place. The crews were warned of a hint of dampness on the exit of Ginger Hall, Ramsey Hairpin, Hillberry and Governor’s Dip and the race got underway at 1.15pm with Holden/Cain leading through Glen Helen on the opening lap. They held a slender 0.9s advantage over the Birchalls with Dave Molyneux/Dan Sayle in third and Tim Reeves/Mark Wilkes, Alan Founds/Jake Lowther and Lewis Blackstock/Patrick Rosney completing the top six. Pete Founds/Jevan Walmsley, sixth in the first race, were early retirements at Quarter Bridge, and Molyneux/Sayle followed them at Sulby Crossroads but by Ramsey Hairpin, the Birchalls had taken over the lead by 1.4s from Holden/Cain. Molyneux’s retirement promoted Reeves/Wilkes into third although they were 7s down on Holden. The Birchalls surged over the Mountain and an opening lap of 115.567mph saw their lead increase considerably to 7.9s and it was Reeves/Wilkes who were now in second with Holden/Cain a further 1.2s adrift. Founds/Lowther were in fourth with Blackstock/Rosney going great guns in fifth. At the head of the field, the Birchalls extended their lead to 13.5s but Holden/Cain were now back up to second as Reeves/Wilkes stopped at Glen Helen briefly before getting back into the race. Founds/Lowther were also in trouble and they retired at Quarter Bridge, which saw Blackstock/Rosney move up to fourth. By Ramsey second time around, the Birchalls had added another four seconds to their lead and there were further changes at the top of the leaderboard as Reeves/Wilkes retired at Lambfell. That put Blackstock/Rosney up into a brilliant third with the top six now completed by Steve and Matty Ramsden, Conrad Harrison/Andy Winkle and Allan Schofield/Steve Thomas. 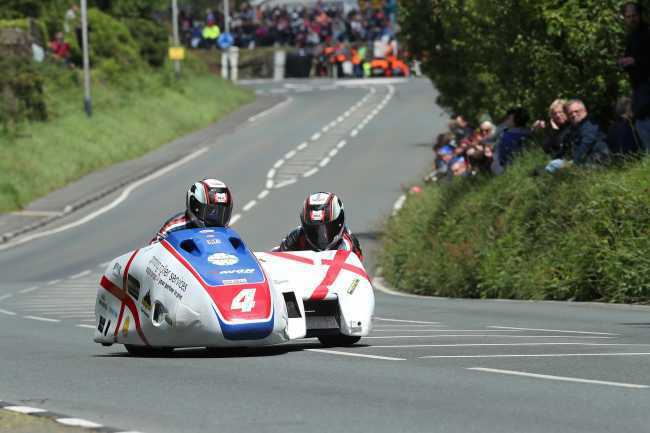 A second lap of 116.423mph meant the Birchalls went into the third and final lap with a healthy 20s lead over Holden/Cain with Blackstock/Rosney maintaining their third position courtesy of their maiden 110mph+ lap around the Mountain Course at 110.599mph. There were to be no changes in the front two over the final 37.73-miles but Blackstock/Rosney slowed and that allowed Harrison/Winkle to take third, the former having to settle for fourth. Karl Bennett/Maxime Vasseur came through for fifth but there was disappointment for the French female pairing of Estelle Leblond/Melanie Farrier who, after lapping at 109.394mph, were forced to retire from sixth on the final lap. Tony Baker/Fiona Baker-Holden, Rob Handcock/Ken Edwards, Greg Lambert/Julie Canipa, Wayne Lockey/Mark Sayers and Gary Knight/Dan Evanson completed the top ten.